May 25th, 2014 International autism forum, primary care conference at Beth Israel Deaconess Medical Center Shapiro 10 and “Spring love for autism” fund raising Chinese Zither Concert at Jordan Hall. American Chinese Medical Exchange Society will hold its Spring medical conference featuring common issue in primary care and international autism forum at Beth Israel Deaconess Medical Center Shapiro 10 conference center from 9am to 4pm. It will cover the new medicines for type 2 diabetes, irritable bowel syndrome, cardiac arrhythmia and COPD, autism and associated other psychiatric disorders, whole body functional medical approach and needless acupuncture treatment for autism, and invited top autism experts from China to talk about autism interventions, integrative treatment and innovative digital programs in China. 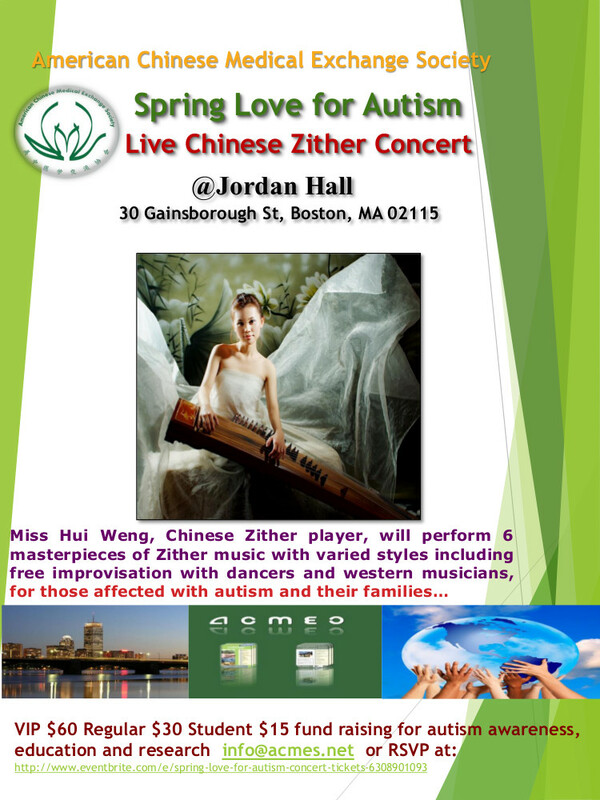 After meeting, will have “walk for autism” from Beth Israel Deaconess Medical Center to Jordan Hall followed by the silent action and fund raising Chinese Zither concert “Spring love for autism” to contribute to autism education. Please come and join us this great whole day event! To register for conference http://www.eventbrite.com/e/acmes-spring-conference-2014-tickets-6182499021 $50 for whole day meeting including lunch and one concert ticket, $25 for students. For concert alone please buy ticket at http://www.eventbrite.com/e/spring-love-for-autism-concert-tickets-63089... student $15, regular $30 and VIP $60. Please contact info@acmes.net for any questions. Copyright 2019 © tocureautism.com All Right Reserved.